As we begin to understand the full magnitude of devastation in Haiti, all of us have wondered how we can help, both as individuals and as a caring community. We all want to do something; the need right now is for money to provide medical care, emergency shelter, and food. Our immediate University-wide plans are focusing on fund-raising for this urgent relief effort. Many members of the Yale community have already committed to a benefit concert on Monday, January 18, at 7:30 p.m. in Woolsey Hall. The performers include Yale Bands, Glee Club and Symphony, Yale Gospel Choir, Shades, Whim 'N Rhythm, the Whiffenpoofs, Schola Cantorum and others. 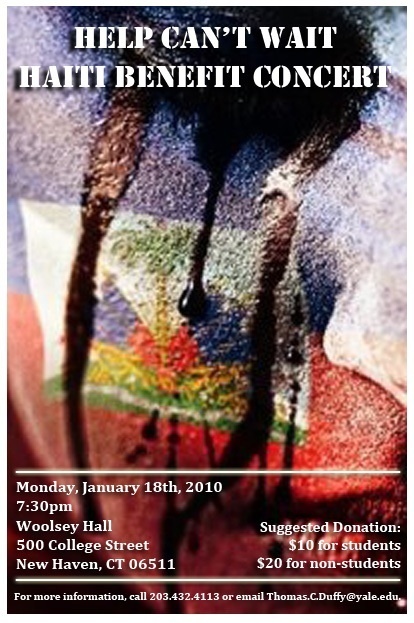 Complete information about the concert and the performing groups is available at www.opa.yale.edu/haiti. Contributions will go to the International Federation of the Red Cross and Red Crescent Societies, Doctors without Borders, Americares, and the United Nations. These organizations already have a presence in Haiti and have begun the work of delivering humanitarian aid, services, and supplies.